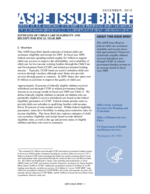 In Appendix Table 4, the estimate of potentially eligible children under federal parameters does not consider state-allowable income disregards when determining whether a child’s family income is below 85 percent of SMI. In some states, income disregards could lead to a higher estimate of children eligible under state-defined rules than under federal parameters. In Appendix Table 5, some children from families below 150 percent of poverty are ineligible for subsidies because their family income exceeds 85 percent of SMI. In Appendix Tables 4 and 5, the two-year average monthly estimates for calendar years 2008 and 2009 use the state median incomes published in the Federal Register: March 28, 2007 (Volume 72, Number 59) and March 5, 2008 (Volume 73, Number 44). The two-year averages estimated with the state-defined rules use the rules in place for October 2009. The incomes from the 2008 data were indexed for inflation to 2009 dollars using the CPI-U.